After having a cup of Chai Tea Latte from Starbuck,I decided to make a cup of Chai Tea Latte by myself. I've bought the spice from India store, however, they are not in powder simply because they don't have label on the powder so I can't identify them. However, I recognized their original shape so I bought them in the raw shape. I don't have a grinder or mortar/pestle. I really don't want to buy them for occasional drink. Is it common way to put the spice directly into the boiling water without grinding them into powder? 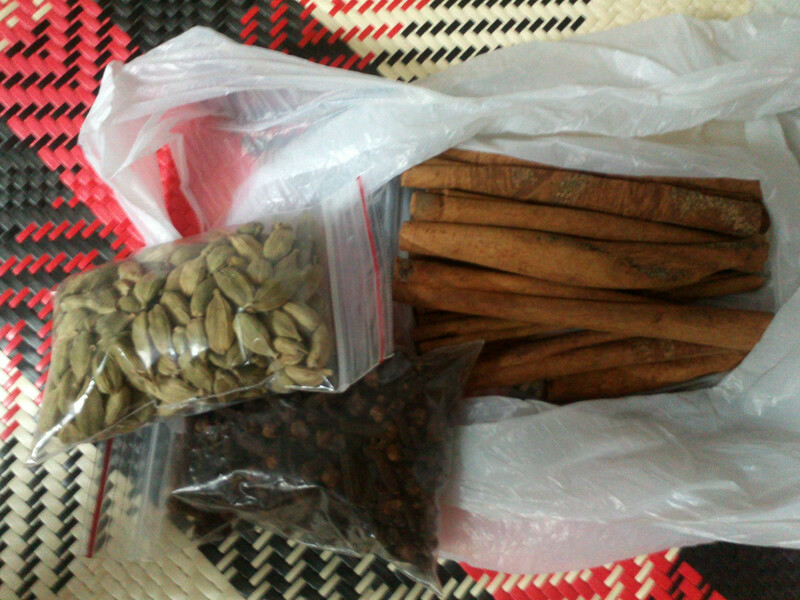 I got cinnamon stick, cardamom pods (green cardamom) and cloves in raw shape. The way we make Chai in India ( there are lots of variants of the spice mix) is to use the spices whole while brewing the tea and to strain the tea before drinking. Though for cardomom you should crush it to release the flavor. I would suggest using your hand or the broad side of your knife blade. I can't speak for science, or the "right" way to do this, but I've always just thrown whole spices right into my tea. You should probably strain it before you drink it, though. I used to do it by throwing handfuls of whole spices into the mix, but I've tried it by grinding it all to powder first in a coffee mill, and the taste is A LOT stronger if you grind everything before steeping it. It also tastes a lot better if you use half and half rather than milk, although that's less healthy. Whole milk would probably also serve that purpose. Grinding also allows you to use less spices, in case convenience or cost are considerations. My recipe calls for using allspice, anise, a bay leaf, peppercorns, and nutmeg (along with the spices your recipe uses). I've never had Starbucks version, or any other company's version, so I have no idea what it's "supposed" to taste like. I do know that all of these spices are antioxidants. I also sweeten mine with either liquid or powdered honey. Since Walmart sells giant tins of the powdered stuff, that's usually what I'll use. I also know that I've never come across any tea bags that come anywhere near the flavor you get from making this from scratch. All of the so-called chai teabags I've ever used basically just taste like weakly flavored black tea. Not the answer you're looking for? Browse other questions tagged tea grinding or ask your own question. How do I make chai latte at home? How is the chai tea latte in Starbucks made? Why should I prefer tea dust over crumbled tea leaves at home?